The old Flushdyke Co-op store now trades as a windows and door fitter, after previously trading as a carpet warehouse. 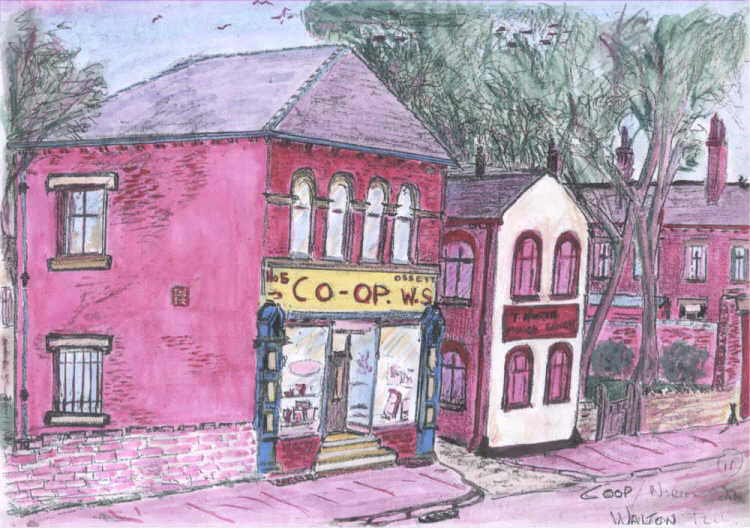 The Co-op store supplied food and provisions to many of the families in Flushdyke for many years. Sidney Brammer, the father of Douglas Brammer who painted these pictures, was manager of the Flushdyke Branch of the Ossett Co-operative Society for around ten years in the 1940s and 1950s. The rag warehouse next door was owned by Frank North, whose father Thompson "Tossy" North originally started the business. The old rag warehouse is now a fancy dress shop. The North family lived in a house at the top of the yard between the two shops and this is now the offices of a media company. Behind the rag warehouse is Walton Place, a terrace of six houses.